I have found the personal need, as Shaman and a Caretaker of these Ways, to engage with people in a more integrative, comprehensive manner, providing something… deeper. 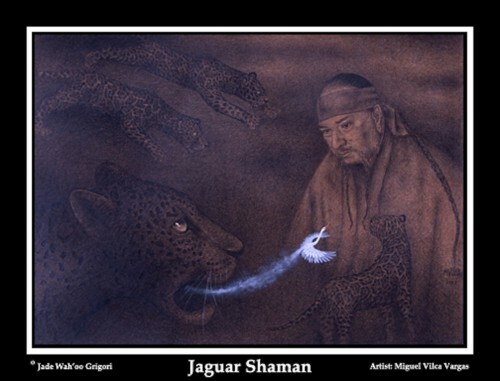 I trust, therefore, that there are those individuals out there who are also looking to engage these Shamanic Ways that go beyond addressing the immediacy of a healing or generalized teaching. Shamanic Empowerments are being offered as three day intensive, in-depth engagements with Jade Wah’oo in a ceremonial context. They are one-on-one, just you and the Shaman. Each Empowerment will be tailored to your unique Spirit’s path of unfoldment. Four Shamanic Healing sessions, 2 each day for days #1 and #2, provide the necessary expanse of treatment to address the multi-layered complexity of your healing focus. On the third day we will experience a Shamanic Journey of Empowerment to tie together the healings and carry them forth to the blossoming of your Spirit’s Path. A Transmission is done in order to transfer the essence, not just the informational teaching, of a particular Shamanic Mystery. The Shaman builds a bundle of Power and resonates it with the inherent nature of the Mystery that lives inside the Shaman’s Spirit. This duplicate of the Shaman’s Mystery and Power is then transferred directly into the recipient, where it takes up residence as a companion Knowledge and Empowerment. This is accomplished on day one. On days #2 and #3 Jade Wah’oo will give teachings and instruction as to the utilization and effective expression of this Shamanic Mystery. This methodology is the very same one by which Jade’s Grampa Peña passed the Caretakership of the Ways on to him. For those who already have a well developed and established spiritual practice, it is beneficial to have an Elder upon whom one can call for insight and guidance in the variety of situations that might arise. This is often a challenging situation, as when one is the person to whom others turn when they are in need, it is difficult to find someone both respected and knowledgeable enough to respond to the needs of someone who is already advanced in their own spiritual practice. Jade Wah’oo can provide such assistance to the advanced practitioner, regardless of methodology, as Jade will be responding to the situation without attachment to or a bias in any specific doctrinal system. The entire three days will be spent delving into the nature of mentoree’s spiritual focus and path. Guidance will be given to help discern where the diversion occurred that has brought about the current challenge. New insights and approaches will be presented for the mentoree’s consideration that would help them build a stronger, clearer expression of their chosen expression of their Spirit’s Path. I will treat you with dignity and mutual respect. My agenda is being in service to your Spirit’s requirements. You will have my attention. Privacy is a matter of honor. Your private information shared with Jade Wah’oo Grigori will be kept between you and Jade. Be present and in attention. Engage what Jade is offering with an open mind and an open heart. Be willing to leave your belief systems at the door. Each of the above listed Empowerment opportunities are $1144 and are based upon a commitment of three days one-on-one engagement with Jade Wah’oo Grigori. Payment in full is due at the time of scheduling the dates of your visit with Jade Wah’oo. Payments may be made with your debit or credit card using PayPal. You must submit a General Registration Form. Make sure to include your email and best phone # to reach you. All Empowerments take place in Sedona, Arizona. Unless otherwise agreed upon a ‘day’ is from 10 am until 6 pm. Meals and lodging are not included. Under no circumstances are the use of illicit substances permitted nor offered. Please do not even ask.